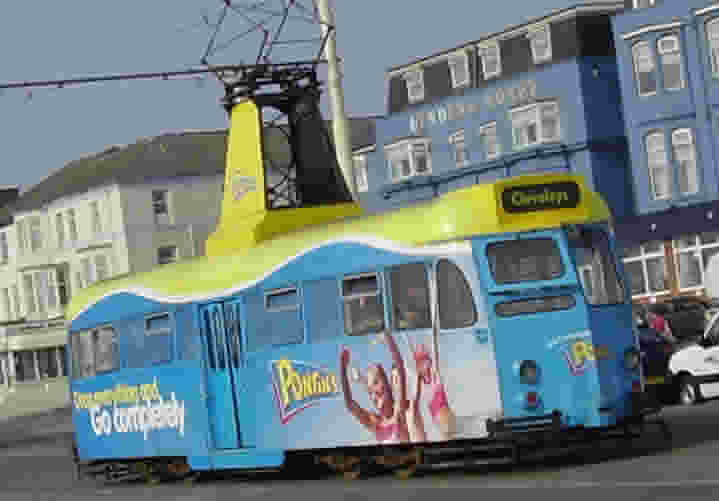 Blackpool now has a fleet of modern trams but some of the older versions discussed below can be seen on certain occassions such as the illuminations. Blackpool trams are as much a part of the town’s heritage as the tower, piers and illuminations, and are a familiar sight on the Promenade. There are a great variety of Blackpool Trams. In 2008 there will be a total of 48 vehicles in operation, as well as 10 cars in storage (either out of service or being overhauled) and a further 14 that have been withdrawn. There are at least ten different types of tram. The mainstays of the fleet are the streamlined double decker balloons of which there are 18 currently in use. These were introduced in the 1930’s when Walter Luff took charge of Blackpool Corporation Transport and set about modernising the system. Twenty six balloons were built , 12 of which were open topped and 14 with covered roofs. In the post war years they were thought to be outdated and attention focused on the newer more frequent faster loading Coronation cars which were seen as the way forward, and as replacements for the balloons. These were beset with problems however and the balloons were given a new lease of life. Even today they are the most common type of tram to be seen on Blackpool seafront . The coronation Cars which were bought to replace the balloons were the most costly trams that the resort has ever owned, and the expense of buying them together with the price of maintenance and repairs almost led to the closure of the tramway. Twenty five coronation trams were built in 1953 and all but three of these have subsequently been scrapped. Two cars are out of service and the single coronation car in use is the famous 304 – painstakingly restored by Channel 4’s Salvage Squad watched by millions of television viewers in 2003. Centenary cars are so called because the first of these started running in 1985, a hundred years after the opening of the Blackpool tram system. There are eight in service making them the second most numerous tram after the Balloons. 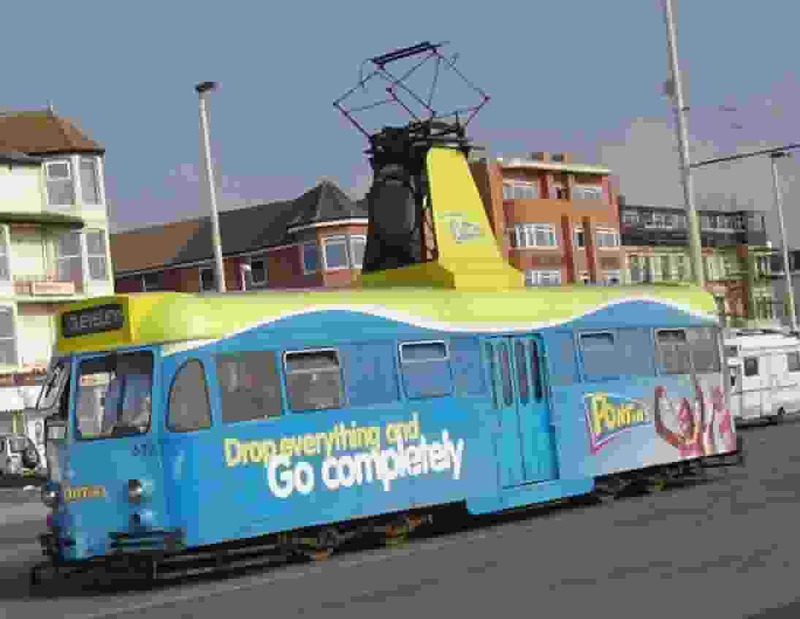 The centenary vehicles have had a troubled history and it is anticipated that they could be taken out of use when the new Blackpool Trams are brought in. Other types of Tram include twin cars of which there are five in operation in 2008, Brush tramcars (5), Jubilees (2) and Railcoaches (1). The open topped Blackpool Boat Trams are always popular with holiday makers and residents alike. They are single deckers with a sleek streamlined appearance, ideal for riding along the promenade on a summers day. There are three of these in service at present. The illuminated trams are just as popular during the famous Blackpool Lights. There are two currently working , these are the Frigate HMS Blackpool, and the illuminated Trawler. Perhaps the most fascinating of all are the vintage tramcars, some of which have been brought from other towns in the UK. The joint oldest is Stockport 5 built in 1901 which has been on long term loan to Blackpool since 1996 and is brought out on special occasions. Bolton 66 also constructed in 1901 has been with blackpool since 1981 and sees regular service both in summer and the illuminations. Other vintage trams are: Sheffield 513, Fleetwood Box 40 and Replica Vanguard 619, but these are rarely if ever in operation. There is even rumoured to be a “ghost tram” in the resort which is not seen but can be heard on stormy winters nights rattling along the track and screeching to a halt. Some say these are spirits annoying people by steering a loud clanging tram along the prom. Others claim it is due to a retired driver who was knocked down by the same tram he had taken on its final ride. Another explanation is that it is an electrical illusion caused by the effects of the salty sea air on the cables. The basic out of season service comprises up to nine trams running at fifteen minute intervals, but from spring to autumn there can be more than 60 vehicles in operation. At busy times they run every few minutes between North Pier and the Pleasure Beach. Fleetwood Transport Festival, popularly known as Tram Sunday, takes place annually in July. Our Blackpool holiday flats are near to the promenade and the tramway is just a short stroll away. Alexandra road tram stop is at the end of the street, and provides a convenient way of travelling along the prom. The nearby resorts of Cleveleys and Fleetwood can also be reached by tram. The cars are fascinating attractions and represent an efficient and enjoyable means of transport in the resort.